Today is the second day of June sneak peeks for Taylored Expressions. I'm sharing another new Moka, Charlotte, and an à la carte image I illustrated for the Whimsical Wishes line. And here's my second CAS card today using the new WOW You're Engaged! à la carte image. I coloured the Ws and highlighted the ring with copics, then cut them out so I could add dimension and pop up that ROCK! I embossed the metallic fushia cardstock with my TE Hearts Impression Plate, but otherwise kept the layout and card simple. Your cards are so sweet! Another hit for TE! Beautifully colored and embellished. Love the CAS. Love the touch of the flowers. 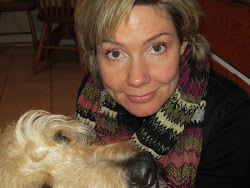 I also enjoyed your blog, very nice! Very sweet cards ..love the bride! Son getting married in November...perfect timing! Love these! Two super cute cards! I love them! Such great color! 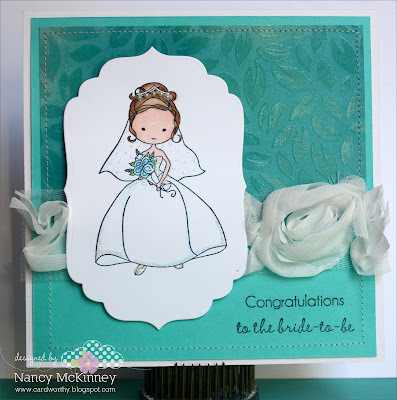 Love the bride with that pretty aqua and then that pop of bright pink for the engagement card! PERFECT! These are beautiful! Adorable images, great layouts! 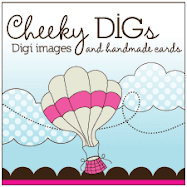 Cute cards and I love the colors you used! Sweet cards. Thank you for sharing. Very pretty love those fabric flowers along with the cute images makes for a pretty card both are great. So beautiful. And love the glamour dust on the dress - because all brides need a little glamour on their big day! Charlotte looks so sweet! I love her sparkly dress and the pretty rose trim! 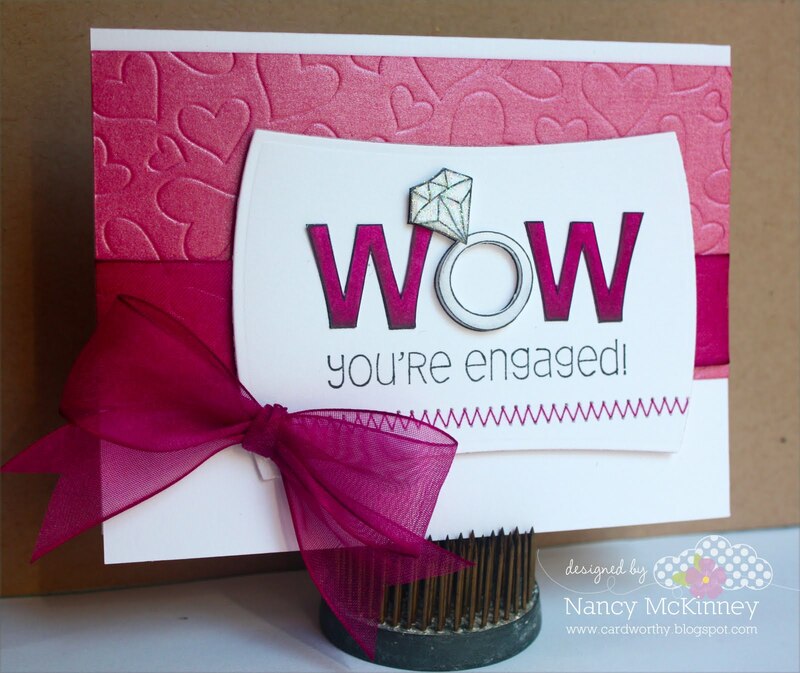 And your engaged card is beautiful! Love the simplicity and the hearts impression adds so much! These are SO gorgeous Nancy! I am LOVING the Moka girls!!! I am having so much fun with this new Moka line and your cards are just gorgeous!!! Such pretty cards! 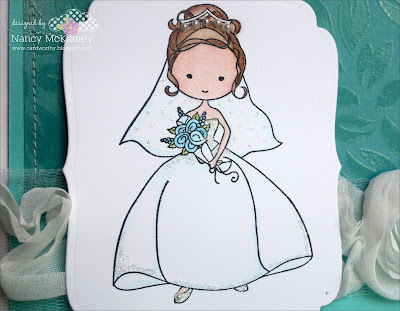 The bride card is so elegant and pretty, and I love the bright "you're engaged" card. Your choice of colors just makes it stand out! These are so classy and fabulous! 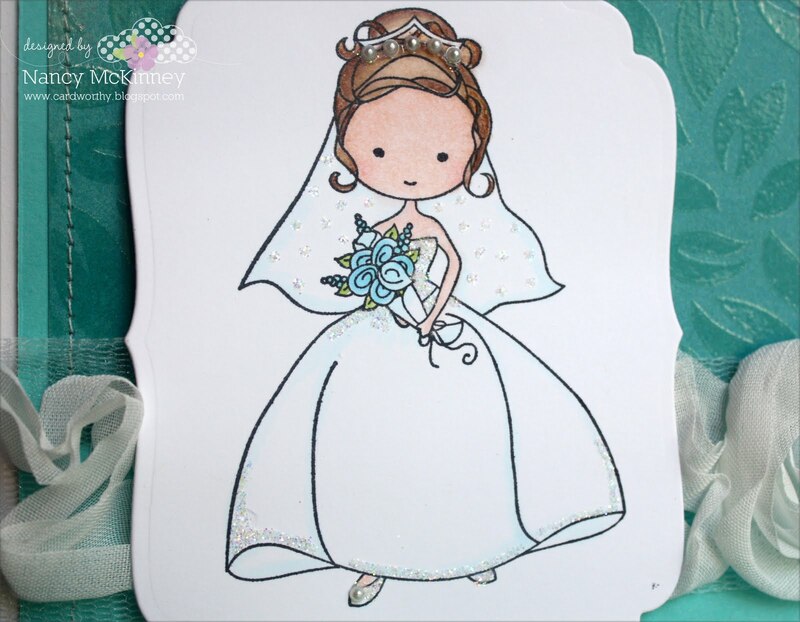 I love the diamond dust you added to the bride, and the embossed hearts look fantastic on your engagement card as well. Charlotte is precious Nancy, and I LOVE how you cut out and popped the ring on the second card!! Gorgeous wedding day cards, Nancy! i just LOVE them! Day 2 of TE Sneak Peeks for July! Day 1 of TE Sneak Peeks for July! 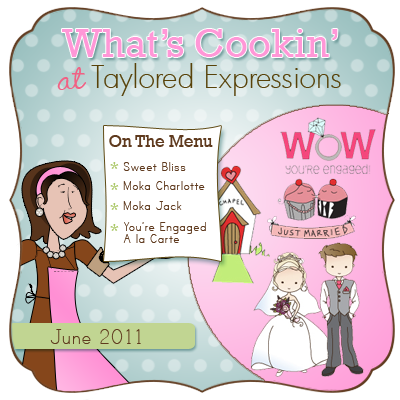 Release Day for June at Taylored Expressions!